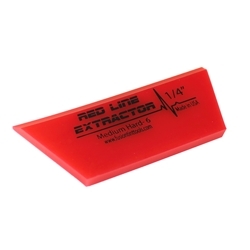 Fusion Red Line Extractor Blades is a 95 durometer squeegee blade that is 1/4" thick. This is the same thickness as the classic Orange Crush and many other similar squeegees. These thick, heavy blades are made for maximum water removal. The 1/4" thick options are available with or without the bevel options along the working edge of the blade. This new design helps your blade last longer.